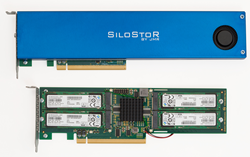 JMR Electronics, Inc. a leading provider of scalable storage solutions, today announced the general availability of their latest SSD plug-in offering, SiloStor™. The new SiloStor is a unique NVMe (Non-Volatile Memory Express) SSD plug-in card that’s a full-length, half-height PCIe 3.0 x8 drive that adds 2TB or more of high-availability, high performance solid stage storage to any server, computer or work station using the latest flash NAND technology. The card occupies a x8 PCIe slot and can also be connected via Thunderbolt® PCIe expansion to those computers offering this capability. In addition, the plug-in card is designed for long-life and touts an MTBF of 1.5 million hours and an endurance rating of 200 Terabytes Written (TBW). Typical random 4K read speed is 90,000 IOPS (sequential read speed of 2,150 MB/s) with a write speed of 70,000 IOPS (sequential write speed of 1,500 MB/s). Pricing for SiloStor starts at $2,599 MSRP for the 2TB card. JMR is a leading value provider and systems integrator of scalable storage systems for high performance and capacity driven applications for multiple markets including; video and post-production, military and government, education, VOD, DCC, gaming, security, medical imaging, HPC and Web 2.0. Since 1982, JMR’s reliable and innovative RAID systems are proudly made in the U.S.A., manufactured entirely from their Chatsworth, California facilities. JMR’s complete line of affordable Lightning™ storage products; SilverStor™ SMB focused products, and BlueStor™ Cloud-ready rackmount and desktop solutions are built to handle the most demanding project needs for A/V centric markets. Reliability. Innovation. Performance. This is JMR. For further information, please visit http://www.jmr.com or contact sales(at)jmr(dot)com, or call 818-993-4801.